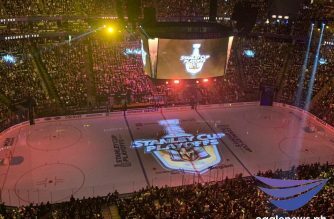 LAS VEGAS, NV (Eagle News) – The energy of 18,301 fans in attendance at the T-Mobile Arena created an electrifying fortress for the Vegas Golden Knights as they hosted the Columbus Blue Jackets in their homecoming game on Saturday evening. Both teams are sitting third in their respective divisions, and Columbus gained some ground winning 4-3 over the defending Western Conference champions. 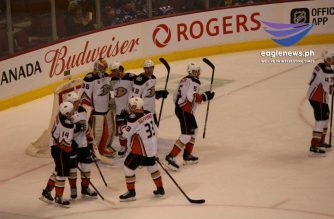 The Blue Jackets began with the first goal of the night by Josh Anderson with the assist from Jones and Boone Jenner in the first four minutes of the opening period. Shortly after, the Golden Knights returned with a deflection goal of their own by their defensemen Nate Schmidt assisted by Jonathan Marchessault to tie the game. With a shift in the defensive position, the Knights then returned with a short handed goal by Jon Merrill to end the period. 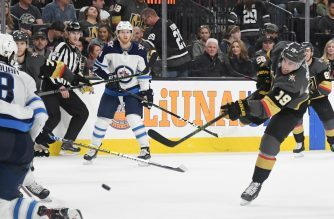 The game took a pivotal turn when Jenner was penalized for cross checking that allowed the Golden Knights to work at an advantage with less than ten minutes remaining in the second period, but did not manage to capitalize on the opportunity. As Marc-Andre Fleury lured out shortly after Jenner’s return, Artemi Panarin tied the game with a wrist shot with less than five minutes remaining in the second period. 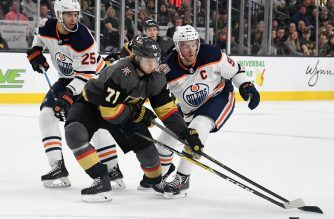 After minutes of stalemate at both ends of the ice, the Golden Knights attacked Blue Jackets Sergei Bobrovsky with a slap shot from Cody Eakin, his 15th goal of the season, to give the Knights the lead in the third period. Cam Atkinson brought the Blue Jackets back into contention with a wrist shot goal and added a power play goal with less than three minutes, his 31st goal of the season giving the Blue Jackets the lead for good.